260 pages | 134 Color Illus. In recent years, the process and outlet for public speaking has grown with digital progressions such as TED talks and Facebook Live. 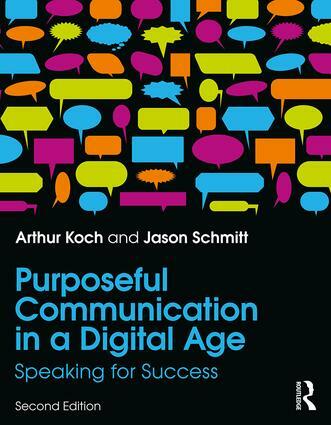 Purposeful Communication in a Digital Age, 2nd Edition, provides a practical, step-by-step approach to developing and delivering effective speeches. Offering supplementary articles, case studies, and interviews with key leaders within the text and online, this is an all-in-one resource for the traditional, online, or hybrid classroom. The new edition devotes focus to presenting in the digital world, addressing both traditional and contemporary forms of presentation, and specifically directs students on seeking out credible sources when conducting research. Its eResource features video speech examples, classroom exercises, an instructor manual, and a quiz bank. Arthur Koch taught Speech and Communication at La Crosse State University, USA, University of Wisconsin-Milwaukee, USA, as well as Milwaukee Area Technical College, USA, where he served as department chair. Jason Schmitt is Associate Professor of Communication and Media at Clarkson University in Potsdam, New York, USA. He is a journalist and documentary producer, with a focus on new technology evolving higher education.